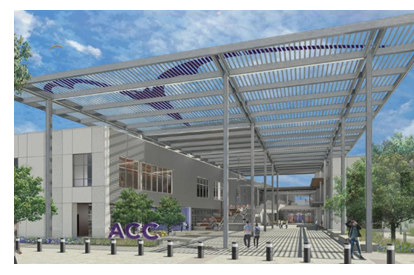 ​​​​​​ AUSTIN – Ground has broken on the $152.8 million second phase of construction on Austin Community College's Highland (ACC) campus​. The 415,000 sf of new learning space—that's about as much space as a downtown skyscraper offers—will "prepare students for high-demand careers and nurture local business growth," ACC said in an announcement. ACC is a major part of the wider revitalization of the old Highland Mall, off Airport Blvd. just west of I-35 and north of Koenig Ln. Hundreds of apartments and retail development are planned for the 81-acre site, which ACC owns. In addition to the business incubator, ACC Highland phase two will have a nearly 125,000-sf digital media center, a 14,000-square foot health sciences/STEM simulation center and a nearly 20,000-sf culinary arts and hospitality management center. ​Check out more education stories across Texas.